This book examines reform of the Russian military since the end of the Cold War. It explores the legacy of the Soviet era, explaining why - at the time of the fall of the Soviet Union - radical reform was long overdue in the wake of changing military technology, new economic and political realities, and the emergence of new threats and challenges. It discusses the problems encountered by Gorbachev in his attempts to promote military reform in the late 1980s, and goes on to analyse in detail the mixed fortunes of the policies of his successors, Yeltsin and Putin. It describes how the onset of war in Chechnya in 1994 provided clear evidence of the weaknesses of the Russian military in modern conflicts, and shows that although the Chechnya debacle did provide some impetus for reforms in the armed forces in 1997-98, the momentum was not continued under the Putin government. 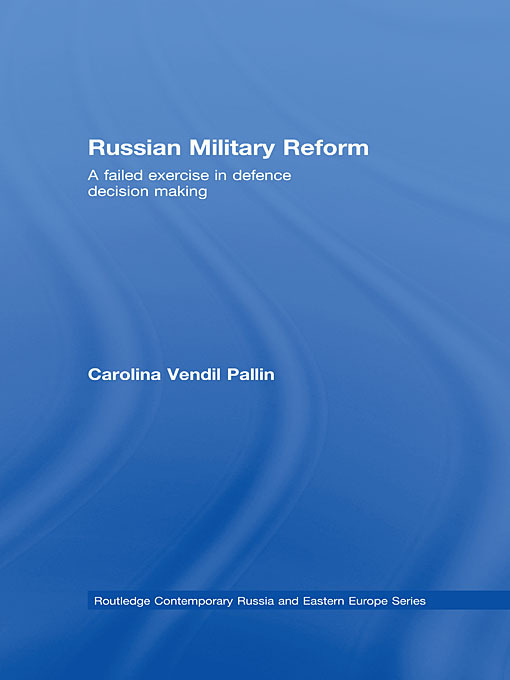 It argues that Putin’s policies of bolstering central control over all aspects of decision making has left untouched many key problems facing the Russian military, including infighting between different force structures, lack of transparency and independent scrutiny over defence spending, and absence of consensus on the main threats to Russia and optimum force posture. Moreover, it argues that in his attempts to concentrate all means of control to a corrupt and inefficient Kremlin bureaucracy, Putin has deprived himself of all alternative channels of independent scrutiny, control and oversight, thus exacerbating the problems that continue to plague the Russian military.